In this book I will argue that in today’s technologically rich context, where content and services are increasingly free, we need to rethink approaches to the design of learning activities and content. I introduce the concept of ‘open design’ and argue that making the design process more explicit and shareable will enable teachers to develop more effective learning contexts for learners and help make the intended design more explicit and shareable with other teachers and learners. It will help learners to make more sense of their educational provision and associated learning pathways. I will provide a number of illustrations of adopting an ‘open design’ approach, from a set of design representations through to the use of open, social and participatory media for sharing and discussing designs. I draw on the areas of learning design, pedagogical patterns and OER (Open Educational Resources) research to explore the creation, sharing and discussion of learning and teaching ideas and designs. The Internet and associated technologies have been around for around twenty years now. Networked access and computer ownership are now the norm. As such the context within which today’s students learn is radically different from the context for learning in the past. There is a plethora of technologies that can be used to support learning, offering different ways in which learners can communicate with each other and their tutors, and providing them with access to interactive, multimedia content. The so-called ‘net generation’ has grown up in this technologically rich environment. There has been a lot of hype about how this generation is used to and comfortable with using a range of technologies to support all aspects of their lives (Sharpe & Beetham, 2010). However, these generic skills don’t necessarily translate seamlessly to an academic learning context. Appropriation of these technologies for academic purposes requires specific skills (Jenkins, 2009), which means that the way in which we design and support learning opportunities needs to provide appropriate support to harness the potential of technologies. The diversity of offerings available to learners also means there is more potential for them to get lost and confused; more than ever before learners need supportive ‘learning pathways’ to enable them to blend formal educational offerings, with free resources and services. This requires a rethinking of the design process, to enable teachers (used in the broadest sense here, from those in K-12 through to tertiary education, as well as designers/trainers in more commercial settings) to take account of a blended learning context. This new learning context also raises some thought-provoking issues. In a world where content and services are increasingly free, what is the role of formal education? What new teaching approaches and assessment methods are needed? How can we provide effective learning pathways to guide learners through the multitude of offerings now available? How can teachers develop new approaches to the design of learning activities and whole curricula that takes account of this new complex, technologically enhanced context? All “action possibilities” latent in an environment… but always in relation to the actor and therefore dependent on their capabilities. For instance, a tall tree offers the affordances of food for a Giraffe because it has a long neck and can reach the leaves, but not a sheep. This term is useful in a technological context because it infers that although technologies have an inherent set of characteristics or affordances (such as promoting reflection or collaboration) these are only relevant in relation to individual users’ own characteristics (such as individual skills and personal preferences and the context of use). Technologies and users therefore co-evolve. The gap between the potential and actual use of technology is a paradox and this paradox is at the heart of the growth of a new area of research that has emerged in recent years. Learning design research aims to better understand this mismatch. It focuses on the development of tools, design methods and approaches to help teachers design pedagogically effective learning activities and whole curriculum, which makes effective use of technologies. The book introduces learning design as a methodology for designing for learning in an ‘open’ context. I argue that it is no longer possible for any one teacher to be an expert in knowing about all the ways in which technology can be used to support learning or be aware of all the latest innovative learning activities or resources that are freely available. Drawing on the research we have been doing in this area, along with related research in the learning design field and closely aligned research areas (in particular work on pedagogical patterns, OER research, learning sciences and instructional design), I will argue that there is a need for a more formal approach to designing for learning. 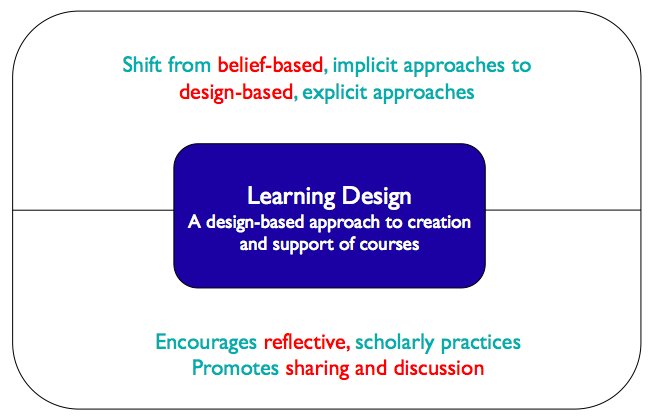 Specifically, that we need to shift from the traditional craft-based teacher-design (where design draws on based practice and is essentially implicit) to a more systematic, explicit design approach, drawing on empirically derived and validated tools and methods for design (Figure 1). I will describe the tools and resources that can act as Mediating Artefacts (MAs) to support teachers in making informative design decisions. For a fuller description of how the term mediating artefacts is being used in this context, see (Conole, 2008). I will show how the research we have been doing demonstrates the value of adopting a more open approach to the design process, to enable teachers to represent, share and discuss learning designs with each other and with students. The book will draw in particular on the research work I have been doing as part of the Open University Learning Design Initiative (OULDI). However it will also locate this work within the broader context of design research from across the learning sciences and instructional design fields. I will articulate my position in terms of designing for learning, through a definition for the concept of learning design by introducing the notion of adopting a more open approach to the design process. I will situate the research work alongside related areas such as instructional design, learning sciences, research into the development and use of pedagogical patterns and Open Educational Resources (OER). The book will also describe the theoretical underpinnings to my work, which are essentially socio-cultural in nature(Daniels, Cole, & Wertsch, 2007; Engeström, Punamäki-Gitai, & Miettinen, 1999), through articulation of the range of Mediating Artefacts (MAs) that can be used to support and guide the design process. A methodology for enabling teachers/designers to make more informed decisions in how they go about designing, which is pedagogically informed and makes effective use of appropriate resources and technologies. This includes the design of resources and individual learning activities right up to curriculum-level design. A key principle is to help make the design process more explicit and shareable. Learning design as an area of research and development includes both gathering empirical evidence to understand the design process, as well as the development of a range of resource, tools and activities. The book will provide a rich basis for critiquing design considerations in learning and instruction. It will make clear both the distinctiveness of learning design as a research inquiry, but also demonstrate how it is related to and builds on other design work from the fields of learning sciences and instructional design. Highlights of work from researchers such as Diana Laurillard, Yannis Dimitriadis, David Merrill, Sasha Barab, Elizabeth Boling, Paul Cobb, Andy Gibbons, Peter Goodyear, Rita Richey, Donald Schon, and Kurt Squire will help provide specific concrete examples. I see this book as marking an important turning point for research in this area. It will be of broad interest to a number of audiences given the increased use and impact of ICT in education. Thus its primary intended audience will be existing researchers in the field. In addition, a major second market will consist of new researchers, reached through the use of the book as a core text for postgraduate programmes (including PhD study) in this area. Finally, I believe that there will be interest in this book from a substantial third group, consisting of teachers and trainers, staff developers, learning technology practitioners and managers who would use the book to orient themselves to these new forms of learning and teaching in post-compulsory education. The book sits at the intersection of a number of research fields and attempts to tackle one of the key challenges facing education – how can teachers design innovative learning experiences for learners in an increasingly technology-enhanced context? The primary audience is researchers in the field of technology-enhanced learning/e-learning. This includes those with a broad interest in researching the use of technology in learning and teaching, as well as individuals with more specialist interests, in particular the research areas of instructional design, learning design, pedagogical patterns, learning sciences and OER research. More broadly, the book will have appeal to researchers in a number of related fields such as computer science, education, information sciences and psychology. The book should be of interest in a number of fields, including: educational technology, learning technology, education, open and distance education. It is envisaged that it would be of relevance to a wide range of masters-level courses in this area and associated areas across Higher and Further Education (including programmes in e-learning, learning technology research, networked learning, educational masters programmes, etc.). There are now a significant number of masters courses concerned with the use of technology in education (ranging from specialized instructional design courses through to e-learning and open and distance education courses). In addition, I anticipate that it will be used as a reference text for induction programmes for new lecturers. It will also be of relevance to related masters in computer science, education, business studies and psychology for example. This will also be of value to consumers of research such as managers, policy makers, learning technologists and staff developers. In addition because the book covers both the theoretical and practical aspects of the subject, it will also be of interest to those with a support role in institutions, such as: learning technologists, instructional designers, educational developers and librarians. A central argument that will be developed in the book is that effective and systematic approaches to design are essential in today’s complex, technologically rich learning context. Teachers need tools and methods to help guide them to make informed decisions about their designs. As such teachers will also find this book valuable; in particular the description and case studies of a range of specific tools and design methods. The book is likely to be of particular benefit to new teachers, as part of induction programmes for new faculty. Finally, the book will look at design from the perspective of different levels of levels of granularity (from the design of small-scale learning activities through to whole curricula design), as well as across the whole design lifecycle (from initial concepts through to evaluation). I will argue that in most institutions, current structures and processes are woefully inadequate to take account of the affordances of new technologies and that effective design using new technologies will require a radical rethink of the whole curriculum process. This has significant implications for institutional strategy and policy. As such the book is likely to be of interest to those in managerial roles within institutions as well as policy makers. · A final relocation in the broader context of learning sciences and instructional design, what niche space does learning design occupy? · The production of the book will be accompanied by a continual ongoing reflective blog and invited questions and discussions in cloudworks. This is building on an established area of research, which I have being involved with over the past ten years or so. In particular it follows on from the development of a Learning Design toolkit, called DialogPlus (http://www.dialogplus.soton.ac.uk/), as part of a NSF/JISC funded project and more recently the OULDI work at the Open University (http://ouldi.open.ac.uk). Aspects of the work have been published in chapters and journal articles but this book provides a synthesis the work to date and provide a clear position/”take” on the field. In addition it aligns this work alongside related learning design research and more broadly research in closely aligned areas (such as instructional design, learning sciences, pedagogical patterns and OER research). The aim of the book is to provide a synthesis and coherent overview of learning design as a research area, within the context of an educational context that is technologically rich and increasingly open. The writing of the book is intended to be adventurous, in terms of adopting an ‘open approach’ to the process of writing the book. This consists of an ongoing series of blog posts about the book on my blog (http://www.e4innovation.com). These posts include initial ideas around the nature and scope of the book, articulation of particular issues I encounter as I am writing, fleshing out some of the ideas for the chapters and associated references. Coupled to this, periodically a series of “clouds” on the Cloudworks site (http://cloudworks.ac.uk), invite the broader research community to participate in a discussion around some of research issues and questions that arise from the content of the book as it develops. Cloudworks will also be used as a means of adopting an open approach to the literature review associated with the book and the aggregation of relevant links and references. The blog posts and the clouds provide a rich set of associated resources alongside the book, as well as a continued space for ongoing discussion once the book is published. To my knowledge the book would provide the first single-authored coherent overview of learning design. The work we are doing as part of the OULDI is at the forefront of research in this field. We have developed a range of innovative tools and design methods, which are generating a lot of interest in the field. We have an evolving Learning Design Toolbox (http://cloudworks.ac.uk/index.php/cloudscape/view/1882), which gives some indication of the scale of our work. The book aims to provide a coherent overview for this work, along with a theoretical underpinning and contextualization with related research in the field. The book also aims to provide a good balance of theoretical underpinning for the field, innovative tools and methods, and practical examples and case studies. Design is arguably the most important aspect of learning and teaching; effective design enables teachers to make informed use of technologies and incorporation of innovative pedagogies approaches, which can meet the challenges of a complex modern educational context. However, design is complex and teachers need support and guidance to effectively incorporate new technologies, to think differently, to change their practice. This book outlines a means of achieving this, along with practical tools and methods. All of the tools and methods described are freely available. The book will also help clarify the relationship between learning design and related fields. It will provide an opportunity to align learning design research with pedagogical patterns and OER research. Conole, G. (2008). Capturing practice, the role of mediating artefacts in learning design In L. Lockyer, S. Bennett, S. Agostinhi and B. Harper Handbook of learning designs and learning objects: IGI Global. Conole, G., McAndrew, P., & Dimitriadis, Y. (2010). The role of CSCL pedagogical patterns as mediating artefacts for repurposing Open Educational Resources’ in F. Pozzi and D. Persico (Eds), Techniques for Fostering Collaboration in Online Learning Communities: Theoretical and Practical. Daniels, H., Cole, M., & Wertsch, J. V. (2007). The Cambridge Companion to Vygotsky: Cambridge University Press %@ 0521831040 %7 1. Engeström, Y., Punamäki-Gitai, R. L., & Miettinen, R. (1999). Perspectives on activity theory: Cambridge University Press. Goodyear, P., & Retalis, S. (2010). Technology-enhanced learning: design patterns and pattern languages. Rotterdam: Sense Publishers. Iiyoshi, T., & Kumar, M. S. V. (2008). Opening Up Education: The Collective Advancement of Education through Open Technology, Open Content, and Open Knowledge: The MIT Press %@ 0262033712. Spector, M. J., Merrill, M.D., van Merrienboer, J., and Driscoll, M.P. . (2008). Handbook of research on educational communications and technology (Third ed.). New York: Routledge. This entry was posted on Tuesday, December 7th, 2010 at 1:48 pm	and is filed under book, Learning design. You can follow any responses to this entry through the RSS 2.0 feed. You can leave a response, or trackback from your own site. I like the way you weave the notion of openness needed in design for learning. I like the sections and themes proposed but would love to know if the notion of collaboration or the participatory element that seems inherent in an open approach to design. A job well done. look forward to getting a full read when it comes out. hopefully could site some of this in my thesis as much of what you express resonate with my research. Openness in the design process seems less a focus on cooperation and more towards collaborative co-construction of knowledge. “Gibson”, not Gibbons, and I still think affordances are a lousy way to try and explain technology use. So there! OOOppps thanks Martin - yes I know your views on affordances but I like the term so there back!!! Gráinne, congrats on sharing your work on this book here; hope this thorough treatment will not count as previously publishing it (for the sake of when it is finally published)! In your definition of “learning design” here on this page, I am not clear no how you are differentiating it from the various terms you are defining in the first chapter, Contextualising learning design. Asking this since I had engaged in instructional design professionally (in the US) for a number of years, and think your more specific definition (earlier in this post) seems to be another aspect of the same thing. Are there fundamental differences in practice or approach, or is this mainly your own frame for this? I am wondering if or how you are working issues of power and positionality into learning design, especially related to the notion for who decides what is learned, and how that often perpetuates power imbalance (cf. Freire). Great that you have a location here to chat about this work. When is it scheduled to come out?